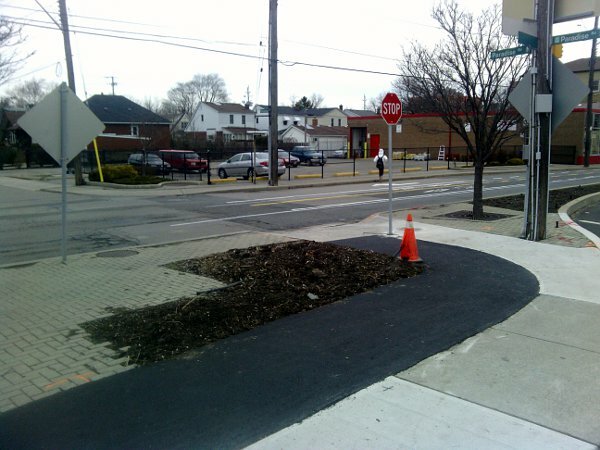 A long awaited section of Hamilton's bike network has finally been completed. The gap between Westdale Village and the 403 Bridge along King Street has been filled. The city has done a fantastic job of accommodating all users along this stretch. Cyclists travelling Westbound from downtown will see some great changes as they approach the end of the 403 bridge. In the grand scheme this is just one baby step, but it is a very long awaited addition and promises to be well used and greatly appreciated. First published on the Downtown Bike Hounds blog. Yeah, I'm actually really impressed with this. Combined with the new bike-lane along Victoria and the one on Dundurn shows that somebody at city hall is finally taking this matter seriously. I am surprised it took as long as it did; it really seemed to take forever. I can't wait to use it. 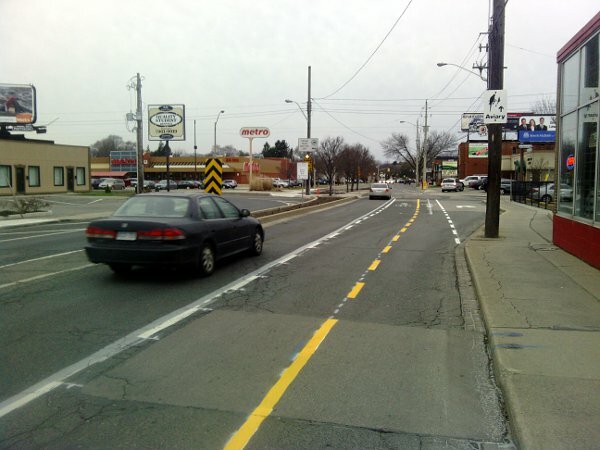 One thing the construction did was to demonstrate that Hamilton's lower city streets have a gross excess of lane capacity. Verry nice to see this .. now if we can see this going East on Main and also King ! There is no reason this lane could not extend all the way to Bay or even James. 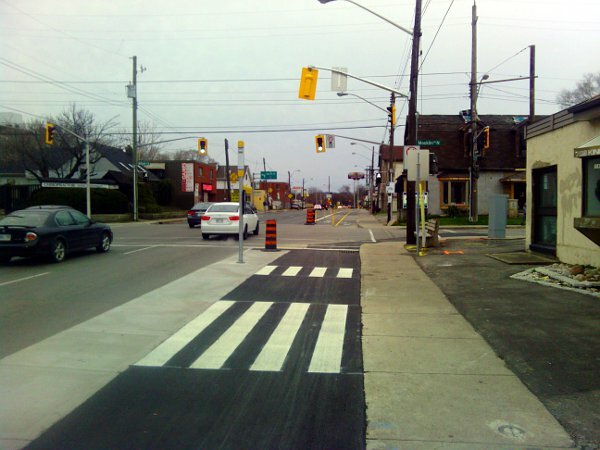 Imagine how amazing it would be to be able to cycle to any destination on King in either direction. We have the space, we have the capacity - let's do it! I think the intent is that you go up to Head/Napier. Perhaps. Then at Napier/Queen you see this... and then what? Such a stupid design when we have the space for a straight line on King. I've long since learned to assume those bike-route signs aren't worth the metal they're printed on. Even in bike-friendly areas they make no sense. The ones in Ainsliewood North consistently send you to the worst places to cross Main. Maybe it's so that you get a scenic trip through the boroughs of our great city. Just a thought. This from the guy who has a bird about the possibility that it might take an extra 2 minutes to drive to the highway. It looks good. Nice to see more bike lanes. I don't know about the bike lane on the island though. That's a pretty tight turning radius. I like the idea of greenery/garden instead of concrete whenever possible, but in this case, it might be worth the increased usability/safety to sacrifice that small "garden". Even if they removed a roughly 4 square foot triangle out of the garden to make the corner easier to negotiate on a bike, it would help a lot. 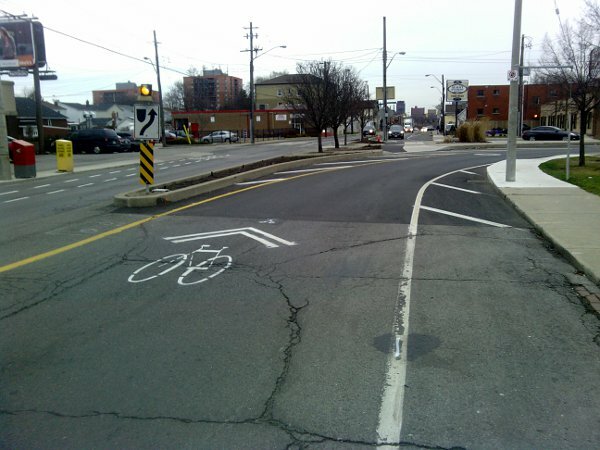 I guess one thing the tight turn does is force a cyclist to slow down to the point they are almost forced to stop where they are supposed to, but still, it just looks so tight, cramped, and not user friendly. It is a little bit tight but I think in practise it will work fine because, as you said, you'd have to stop right after that turn anyways. does anyone know who is responsible for this positive step forward? is there a way that we can show them how appreciative we are of this development? it would be nice for them to know that the public is paying attention and does care when the city gets something right. Email all of council. The only way this stuff will keep happening is if they all hear it. 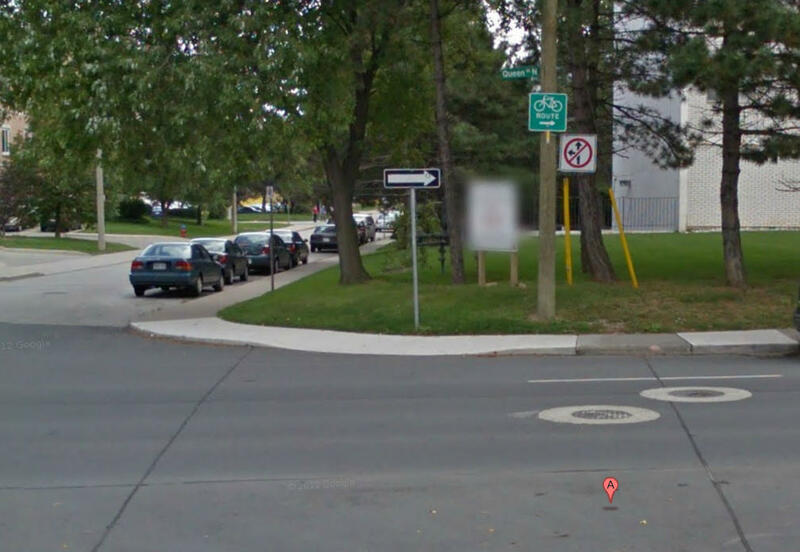 This stretch was on the cycling master plan, so it was slated to happen "eventually". Daryl Bender is the staff person who is closest to being "in charge" of the plan. My guess is its Brian McHattie. I can't see staff proactively designing it this way.